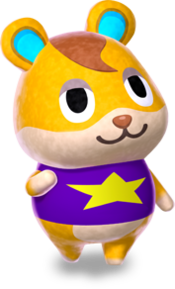 Hamlet (ハムスケ, Hamusuke) is a jock, hamster villager in the Animal Crossing series. He first appears in Animal Crossing: New Leaf. His name refers to his appearance as a small hamster and may also reference the Shakespeare character Hamlet. Hamlet is an orange-yellow hamster with tan accents on his mouth, limbs, and belly. He has brown hair on the top of his head, and has rounded ears, with a bright-blue inner-coloration. Hamlet wears a purple tank with a yellow star. Hamlet has a jock personality, which means he often will talk about sports and athleticism with others. Jocks normally talk about working out, and if they are camping, Jocks often say they were running and running and ended up in the player's town. He will get along well with the player and most other villagers. He will not get along with and is offended by lazy villagers since they oppose his sporty lifestyle and like their couch-potato lifestyle more. File:Sky/Sandbox/SnowPicACNL.png Please insert ACNL picture quote here. Hamlet's house appears child-themed. It includes an Elephant Slide, a Mega Drilloid, bowling pins, and a Sloppy Carpet. He also has a Kiddie Stereo that plays "K.K. Reggae." Modified on August 14, 2014, at 18:18.